Making the vintage tripod lamps was the inspiration to start my own lamp business so they have a special meaning to me. The studio spot has been used in the past at big events and I have rebuild this onto a retro camera tripod. 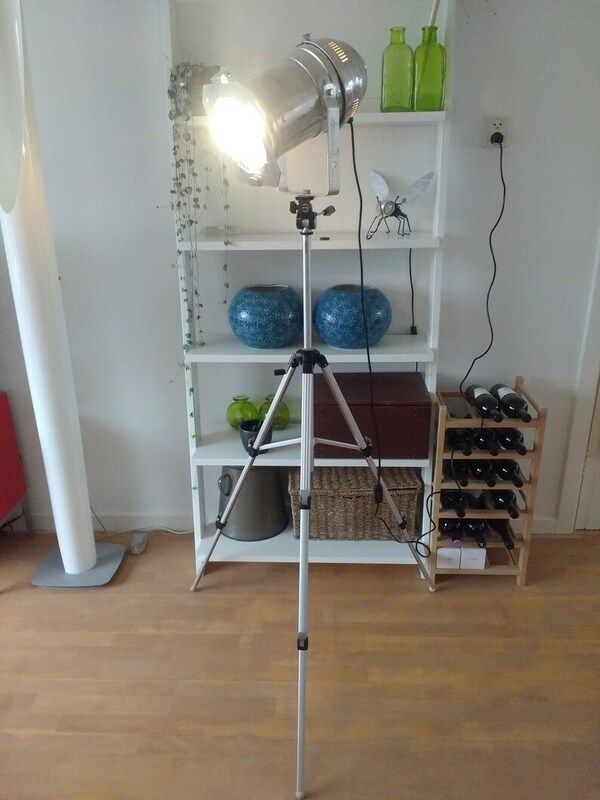 Besides the cool look of this lamp it can also be used in multiple ways since the tripod can be adjusted into different heights and the spot itself is 3D adjustable. I have replaced the original 500Watt PAR lamps with an E27 socket which is way more convenient and uses a lot less energy. Finally I have added new wire, an on/off switch and a type C electric plug. The type C electric plug is common in many countries. If this is not the case in your country you can simply replace the plug or use an adaptor. If you have any questions or wish to buy this lamp please sent me a message and I will get back to you asap. Worldwide shipping possible. - Suitable for 110-240V. Max 60W lightbulb. I pack my items with great care. I use recycled boxes, air bags,styrofoam and bubble wrap. In order to avoid breakage, I might pack items separately. Track & Trace information will be provided if available to your country, so you can follow your parcel 24/7. If you want the lamp to be shipped to a different adress than in your Etsy account please contact me prior to your order. If you want me to include a light bulb for some additional costs to your order please contact me and I can let you know what the options are. Customer satisfactory is my highest priority so if you are not satisfied with your product please contact me within 14 days after arrival of the lamp. Please be aware that this is an electrical product so whilst installing this product take precautions for the safety of yourself and others. In case of any doubts I recommend that my lights should be installed by a professional electrician. For all the electrical components I use only CE, EN60598 certified products. This product should not be installed outside or in humid spaces such as bathrooms, sauna’s etc. Carla's lamps inspired me right away so the only question for me was which lamp to buy. I was actually looking for a table lamp and Carla was so kind to rebuild this pendant lamp into a table lamp. The lamp simply looks great and gives my house the extra warmth and finishing touch. Contact with Carla was great and shipping went smooth. I can highly recommend a lamp from Wonderwire! I just love the vintage look of this lamp and on top of that it is great that you can adjust the lamp in all possible directions and angles. The floor dimmer works great and you can simply adjust it with your foot. Ik ben superblij met met mijn zwarte spot, Carla bedankt voor het goede advies. Het openstellen van je huis waar al je zelf gemaakte lampen te bezichtigen zijn is echt top! Lichtplan nodig voor bestaand of nieuw huis? Carla Keizer is de aangewezen persoon!